The Department of Classics at Reading was delighted to welcome back one of its most distinguished former members at our recent graduation ceremony. 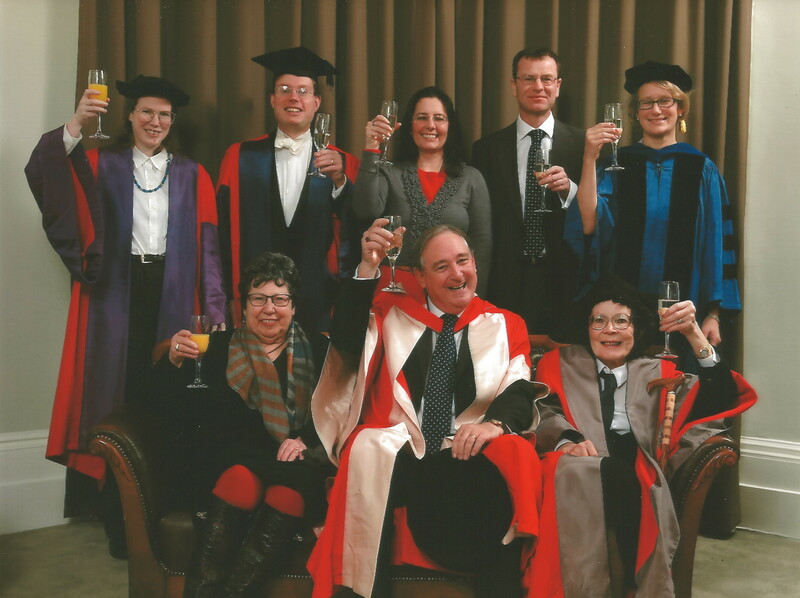 Alongside several of our own BA and MA graduates, the University of Reading celebrated the disciplines of Classics and Archaeology by conferring an Honorary Degree on Professor Andrew Wallace-Hadrill, OBE, FBA, FSA. Professor Wallace-Hadrill, former Master of Sidney Sussex College, Cambridge, is currently Honorary Professor of Roman Studies at the University of Cambridge and is the Director of the Herculaneum Conservation Project. They might, however, not know that Professor Wallace-Hadrill’s contributions to the discipline of Classics are even more wide-ranging and far-reaching, and that he has a special connection with Reading Classics Department. Wallace-Hadrill was appointed to the Chair in Classics at Reading in 1987. With his arrival, Reading’s Classics Department began to explore new avenues of Classical scholarship and also began to grow steadily in size, transforming itself into the strong department it now is. In 1995 he was appointed as Director of the British School at Rome, the base for British archaeology, ancient history, and fine arts work in Rome and Italy. He held that post until 2009, on secondment from Reading. Under his leadership the BSR underwent a considerable transformation, acquiring new and improved facilities, which made it an enviable centre for research and scholarship. Thanks to his Reading connection, it was possible to develop our unique and still-thriving MA programme, the MA in the City of Rome, which included a two-month study period at the BSR. His legacy here is also visible in our Department’s close links with the BSR and its continued interest in Roman history, archaeology, and architecture. His understanding that proper conservation for large archaeological sites is a considerable challenge made him a champion in promoting the importance of conservation and regular maintenance, particularly in the case of Pompeii’s less well-known ‘sister’ town, Herculaneum. Here exposure to the elements had led to severe degradation, and The Herculaneum Conservation Project, led by Wallace-Hadrill, sought to arrest and reverse that decline. Generous funding from the Packard Institute for the Humanities and support from the local Soprintendenza Archeologica and the British School at Rome enabled major progress to be made at the site, with new archaeological discoveries emerging alongside the vital preservation work. The honorary degree presented to him on Friday December 12th is thus a fitting recognition of his contribution to many key areas of our discipline, and to the University of Reading’s long and distinguished history of excellence in Classical research and teaching. The occasion was duly celebrated afterwards at the Acacias Senior Common Room with drinks and lunch hosted by the Chancellor and Vice Chancellor.